Our face has countless pores where dirt, oil, and bacteria may get trapped. Even when we’re asleep, there is no escape from these pollutants. The environment plays a huge role on how much dirt accumulates in our face. Have you ever been so frustrated getting rid of all those pimples, acne, and zits on your face? 1. Dirt, oil, and bacteria settle in the pores. 3. Clogged pores inflame due to infection. Wanna know the myths and truths about pimples? MYTH 1: Peanuts, chocolates, fried chicken, and oily foods causes pimples. What the Derma says: Dirt causes pimples contrary to what we know. MYTH 2: Prick pimples for them to disappear. MYTH 3: Washing your face with soap is the best way to prevent pimples. What the Derma says: Yes, soaps clean your face but they cannot remove the deep-seated dirt that causes pimples. Use facial cleanser to ensure no dirt is left behind. MYTH 4: Using facial cleansers have that burning sensation when used. What the Derma says: ESKINOL Facial Deep Cleanser is dermatologist-tested to be safe for everyday use. Determine your skin type. The first thing that you need to do before you try on a product is to determine if you have natural, oily, sensitive, dry, or combination type of skin to know what best suits your skin. Practice Good Hygiene. Always wash your face to remove the dirt. East Balanced Diet. Aside from genetics, hygiene, and hormones, your diet affects the condition of your skin. The skin is an indicator of how healthy or unhealthy your body is, so make sure to get a good mix of anti-oxidants and nutrients from different food to help boost your immune system – your body’s defense mechanism that is responsible for warding off disease and fighting off infections. Get enough sleep. When you sleep, your body goes into repair mode. During this time, your skin rejuvenates, restores, and rebalances itself, growing new skin cells to replace older ones. This is way your skin glows when you’re well-rested. Sleep also reduces the presence of Cortisol, a stress hormone that ages skin and causes pimples. Eskinol has Micro-Cleanse Anti-bacterial formula. 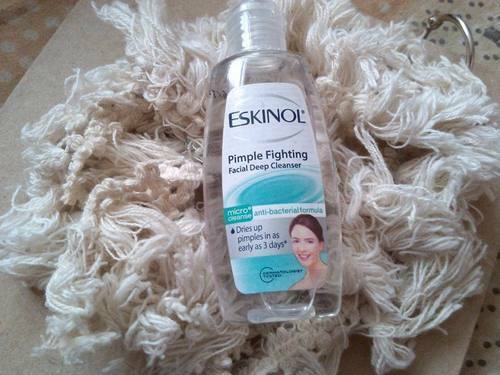 With a cotton ball, Eskinol removes deep-seated dirt that causes pimples. I received this sample size from National Bookstore last Monday when I bought something for my personal decorating materials. I don’t actually use facial cleansers since my face is very sensitive that it reacts easily to facial products, that’s why I only use water to clean my face. However, I tried using this sample and in all fairness, it dries pimples overnight. It may cause a light burning sensation especially when you have open pores and opened pimples. Well, it may not remove the blemishes and dark spots, but one good thing I love about this product is that it dries pimples easily! I will definitely try another one.